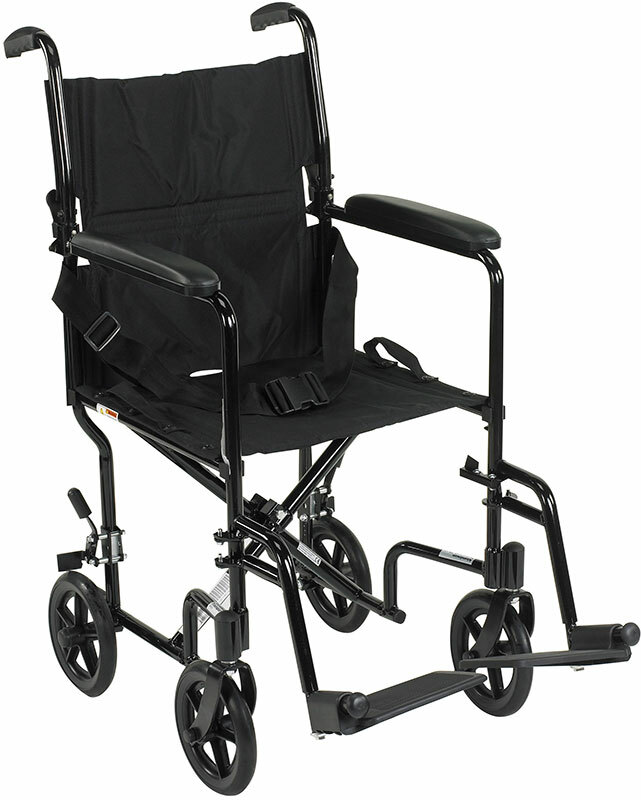 The 17" Aluminum Transport Chair in black by Drive Medical is lightweight and strong, making it easy to transport. The 17" Aluminum Transport Chair in black by Drive Medical is lightweight and strong, making it easy to transport. The black, nylon upholstery is comfortable, lightweight and easy to clean. The 8" caster wheels are lightweight, maintenance free and provide a smooth ride over most surfaces. It comes standard with swing away footrests with heel loops, padded armrests to provide additional comfort and rear wheel locks to ensure safety. Easily folds for convenient storage and transportation. Limited lifetime warranty. Weighs only 19 lbs. Aluminum frame is lightweight and strong. Composite 8" wheels are lightweight and maintenance free. Both 17" and 19" come with swing-away footrests. Padded armrests provide additional comfort. Nylon upholstery is comfortable, lightweight and easy to clean. Aluminum casted back release hinge allows back to fold down for easy storage and transport. Standard rear wheel locks. Limited Lifetime Warranty.